Not many 2-year-old toddlers can even stand tall enough to create a mural but meet Hannah Hollister Ingmire—Alliance Art Gallery’s September guest artist—who confidently uncorked lipslick onto her parents' bedroom walls (not well received) to launch her artistic career. At five years old, her rendition of a little tired train chugging up a hill appeared in the Philadelphia (PA) Art Museum children’s exhibit. By sixth grade, Ingmire studied under Fritzi Morrison, of the American Watercolor Society. And by 1966, she had graduated from Grinnell College with an BFA in painting, going on to graduate work in Fine Arts at the University of Iowa. With exhibitions and juried art festivals across the nation in Wisconsin, Iowa, Michigan, Illinois, New Mexico, Idaho, Florida, and Missouri, Ingmire's work resides in numerous businesses, civic institutions, and private homes. A member of the Columbia Art League with a studio at Orr Street Studios, she exhibits and teaches in Columbia, Missouri. 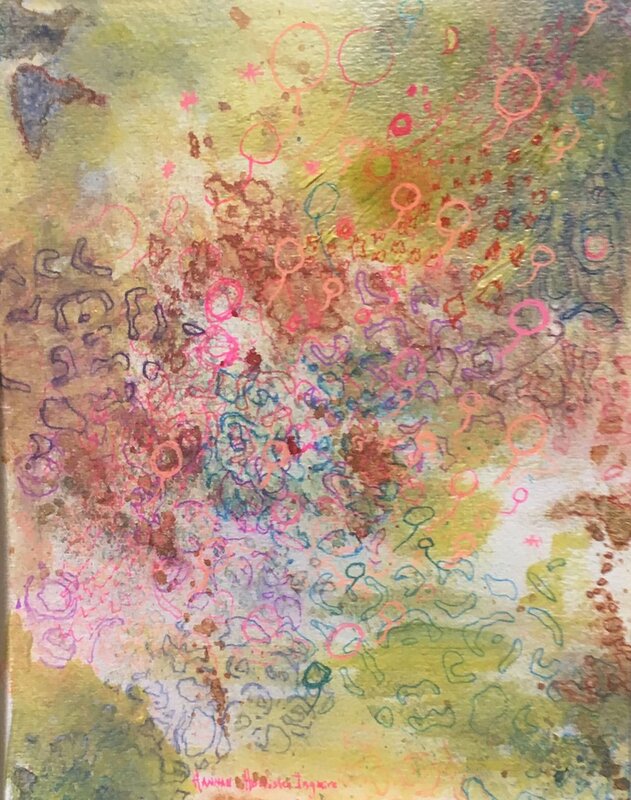 “Today,” she explains, “I am moving more into experiments with mediums. I teach three classes on ‘spontaneous art’—those are my words. I believe that as children our creativity comes naturally but we often tend to lose that spontaneity as we grow up and adapt to society’s norms. I encourage my students to find their natural creativity by experimenting. In her own creations, Ingmire starts from a watercolor-as-background beginning. “I begin very non objectively. As I go along, I start seeing something in it.” The interaction between artist, instinct, and response starts to unfold. She allows composition, color, and the addition of medium to explore one another, pulling effects out, guided by her intuitive sense of where a painting begins … and where it ends. One could say she began as an instinctual artist—with a tube of lipstick in her hand. From that unconventional medium to today’s creations, the results are vibrant and multi-textured, hovering between realism and abstraction, inviting you into your own instinctual world. An opening reception will be held on Saturday September 9 from 5:00until 8:00. This coincides with Hannibal's Second Saturday Gallery Walk.